Our money is on the MKC’s Select trim level. This opens up the ability to add nearly any option in the catalog while keeping the overall MSRP in a reasonable place. The 2019 Lincoln MKC is back with a facelift and a nosejob, but not much else has changed for the entry-level luxury SUV. With a more refined, modern look, the MKC finally has the highbrow looks to match its Lincoln street cred. Lincoln’s entry-level 'ute starts at just under $35,000, which is over $600 more than the model year before it. Prices climb from there and reach into the $50,000-range for the Black Label model with all-wheel drive. Those aren’t entry-level prices by any means, but Lincoln has added just enough to the 2019 MKC to make the case for the extra dollars. The MKC is offered in four trims for 2019: base, Select, Reserve, and Black Label. Even the base models are equipped with Apple CarPlay and Android Auto compatibility, 18-inch wheels, and premium audio. Super-luxe Black Label models receive the full treatment with designer interior themes (more on this later), annual vehicle detailing, car washes on demand, and concierge services with exclusive restaurant booking. Two engines are on tap for the MKC line in 2019, with a 2.0-liter turbo-4 and optional 2.3-liter turbo-4 making their way under the hood. The engines produce 240 hp and 285 hp respectively. Front- and all-wheel drive are offered across the range, but MKCs equipped with 2.3-liter engines are only available with AWD. Interior finishes, even with a few stray budget materials thrown in, are excellent. The front seat experience is one that rivals those in vehicles at much higher price points. Rear seats, while nicely appointed, suffer from the MKC’s smaller stature overall. The MKC will never be accused of being cavernous, but for small families, first-time luxury buyers, or empty nesters, the small Lincoln may be just right. With rear seats folded down, up to 53.1 cubic feet of cargo space is available. 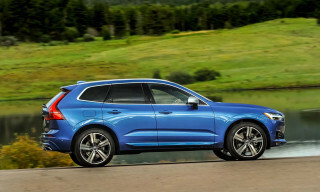 The refreshed 2019 MKC visually delivers on its luxury promise, and the interior alone makes the little Lincoln worth a drive. 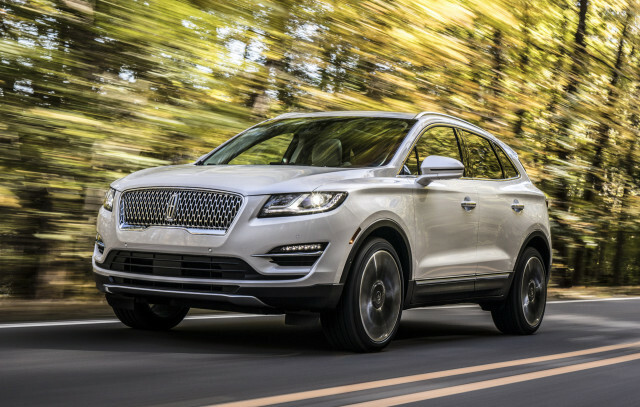 Lincoln has moved the MKC more in line stylistically with its sedans and the two larger SUVs in its lineup, and that’s a very good thing. The outgoing model wasn’t ugly but lacked definition in its styling, thanks to a split grill and well-endowed rear end. The 2019 MKC takes its grille and front-end styling cues directly from the refined look of the Navigator. Chrome-heavy and sculpted, the new centerpiece is flanked by lightly reshaped LED headlight units and a tasteful chrome-accented lower bumper valance. In profile, we’re hard pressed to find any substantial differences from last year’s model, and around back there’s a little more chrome but not much else to report. Inside, the MKC is a legitimate luxury contender, with tastefully-placed wood grain and brushed metal finishes. Even with darker color palettes, the cabin’s lines and window shapes keep the interior feeling open and inviting. With a beautiful, albeit simple dash and center console, the view from the MKC’s front seats doesn’t leave much to be desired. 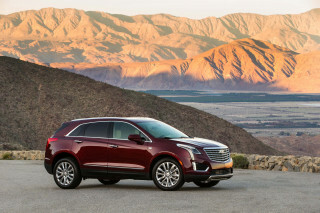 Most people will find the MKC’s base engine to be more than good enough. The 2019 MKC’s exterior updates didn’t translate to updates under the hood, but that’s OK. Both 4-cylinder options on tap are more than acceptable, even giggle-worthy at times. The base engine’s 2.0 turbocharged-liters produce 240 horsepower and 270 pound-feet of torque, while the 2.3-liter variant makes 285 hp and 305 lb-ft of torque. With two very similar 6-speed transmissions available, both of the MKC’s powertrains come together to make an experience that is more than just the sum of its parts. The smaller engine does its job by fading into the background, hidden mostly by strong active noise cancellation and sound deadening. Start/stop tech saves fuel, but also makes the engine almost disappear at times. The optional 2.3-liter is nothing short of overkill. 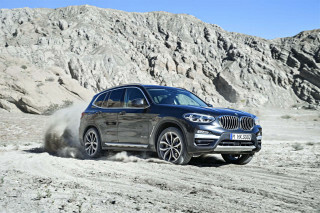 Exclusively paired to the MKC’s AWD drivetrain, the larger engine pushes the small SUV to a sub 7-second 0-60 mph run. While the power is good for a few laughs, the base powerplant will serve most people without issue. The MKC’s optional adjustable damper system, while complicated to control, keeps everything tidy and tame under a variety of conditions. That said, the MKC is best suited for unhurried driving on roads that fall short of twisty. In “Sport” mode, the MKC is rough and more punishing to our backsides than we’d like, but the overall ride and handling are on-par with its European rivals Audi and BMW. The MKC tows up to 3,000 pounds in all configurations. Even in base trim, the MKC punches above its weight class, but all models suffer from lack of passenger space. The MKC’s cabin materials benefit from the 2019 update, especially in the Black Label model, with clever design themes like Heritage (white leather and Argento wood), Indulgence (brown leather with Ziricote wood), and Center Stage (black leather with red piping and Alcantara seat inserts). The result is an interior with fewer noticeable budget materials and a higher-end feel throughout. With a base model interior covered in synthetic leather and cloth, the MKC doesn’t seem to start out very deep into luxury territory. Even so, the seating surfaces are supple and spacious, which make the MKC feel much more expensive than its $35,000 base price. Each upgraded trim level gets interesting touches that bump the luxury quotient considerably, like the Reserve trim’s Bridge of Weir (that’s Scottish) leather upholstery. A spirited drive reveals a lack of bolstering in the front seats, but we haven’t seen any Lincoln-sponsored race teams lately, so slow it down and enjoy the cruise. Rear seat leg room and head room suffer from the MKC’s compact overall dimensions. The 36.8 inches of rear leg room should be adequate for most legs. While the rear seats are decently sculpted, there is a notable lack of cushioning all around. Even though the dual-pane sunroof adds considerable openness to the cabin, it takes back more than its fair share of head room. Shoppers looking to regularly transport adult passengers in the rear seats should try before they buy. All MKCs feature split-folding rear seats that bump the existing 25.2 cubic feet of cargo space to 53.1 when folded down. Lincoln’s signature quiet ride is on full display in the MKC, with active noise cancellation in Reserve and Black Label trims. Full safety data isn’t available yet, but the MKC could use more advanced safety technology at all trim levels. This year, Lincoln offers forward-collision warnings with automatic emergency braking, but it’s reserved for a pricey optional package at higher trim levels. Blind-spot monitors and rear cross-traffic alerts are available, but the MKC is otherwise absent some of the standard advanced safety features that are so common in this segment. 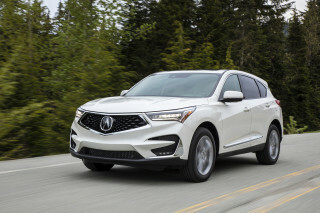 The 2019 MKC is well-equipped in base trim and offers interesting options across the range. The 2019 MKC comes in four flavors: base, Select, Reserve, and Black Label trim levels. A rolling wi-fi hotspot, Apple CarPlay and Android Auto compatibility are standard across the range, 18-inch wheels, along with a nine-speaker audio system and 8.0-inch touchscreen with Ford’s Sync 3 system on board. Select-trimmed MKCs get leather upholstery, ambient lighting, and offer more customizability including a panoramic sunroof, navigation, blind-spot monitors, and heated front seats and steering wheel. Black Label trim tops off the MKC lineup by adding 19-inch wheels, upgraded leather interior, Alcantara headliner, “curated” color themes, concierge services, special maintenance scheduling accommodations, and continuously controlled dampers. Many of the included features on higher trim levels are available a la carte on less expensive models. Navigation, dual-pane sunroof, and continuously controlled dampers can be added in Select and higher trim levels. MKCs can be equipped with the 2.3-liter turbo-4 starting in Select trim levels, and all-wheel drive becomes standard with that engine choice. All other models can be upgraded with AWD. The 2019 MKC is relatively frugal with fuel, but it lags some newer competitors. The 2019 MKC’s fuel economy has room for improvement. Base models with front-wheel drive are EPA-rated at 20 mpg city, 27 highway, 23 combined. Others don’t fall far from there. 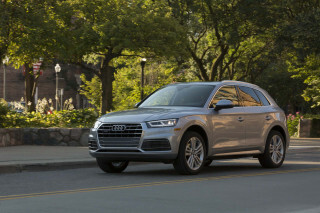 All-wheel-drive MKCs take a small haircut on fuel economy, getting 19/25/21 mpg, and the larger 2.3-liter turbo-4 engine shaves 1 mpg from city and combined ratings.